This page provides info on registration, metering and water distribution systems and exemptions and links to forms and other information. Below the Frequently Asked Questions are links to downloadable forms and instructions. Who must register their well? All owners of wells located within the District are required to register their wells. How do I register my well? All owners of wells located within the District are required to register their wells by completing a Water Well Registration Form. The form and instructions for completing it are provided to prospective well owners when they apply for a Permit to Construct a Water Well at the Monterey County Department of Health, Environmental Health Bureau. Note that there is a $50 fee for registering or amending the Water Well Registration form. An amended form must be filed if a property with an existing well is sold. Why do I have to report annual production? All well owners within the District are required to report the amount of water produced each water year (October 1 through September 30 of the next year). Forms are mailed to registered well owners near the end of the Water Year (September 30) and need to be returned to the District within a few weeks so the Annual Water Production Summary Report can be prepared. This Annual Report consolidates information on water production by area and helps the District better manage the overall supply. For example, computer models for the Carmel River or Seaside Basins need to accurately account for water input (such as rainfall and streamflow) as well as outputs (such as extraction by wells, evapotranspiration by vegetation, etc). Also, having metered well production records is the best way to quantify a property owner’s water rights if there ever is a Court Adjudication of a water basin. My well is inactive; do I have to report? Yes. It is important that all wells are accounted for. Inactive wells need to be reported to be sure they are properly metered and registered if they become activated. Periodic reporting of inactive wells avoids losing track of their location and owners, which helps prevent unsafe or improper abandonment. Reporting – All well owners within the District are required to report the amount of water produced each year. Forms are mailed to registered well owners near the end of the Water Year (September 30) and need to be returned to the District within a few weeks so the Annual Water Production Summary Report can be prepared. Online form for WATER METER METHOD of reporting. Metering – All new wells are required to be equipped with water meters acceptable to the District. Meters are to be installed and inspected within 90 days of well completion. The District’s Water Meter Installation Standards and Guidelines are provided with new well construction permits at the Monterey County Department of Health, Environmental Health Bureau in Salinas. Who supplies the water meters? 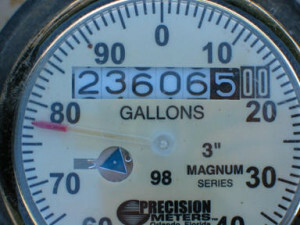 Meters are available from many well contractors, plumbers, and plumbing supply houses. Some handy homeowners install their own, which is acceptable, providing the installation conforms to District Water Meter Installation Standards and Guidelines. Some meters have a self-explanatory digital readout; however, most water meters have a “totalizer” on the register face that keeps track of the total volume of water that has flowed through it, and a dial that sweeps around the outer face of the meter to calculate the rate of flow. The totalizer is analogous to the odometer on a car, and looks quite similar, while the dial is comparable to the speedometer. When filling out the Annual Water Production Reporting form, write down all of the numbers on the totalizer and the date it was read. Most have six digits that turn, followed by one or two stationary zeros. If there are any stationary zeros, please include those in the reading. For example, the water meter pictured to the right has one stationary zero in the totalizer. It should be read as “0015420 gallons”. The inverse coloration of the 4 and 2 are an aid for timing the rate of production. While there are exceptions, for example meters that register in very large units such as acre-feet, most totalizers do not have decimal places. 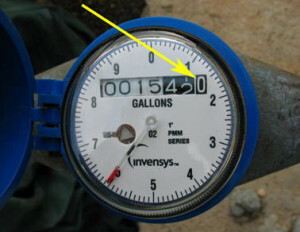 Each sweep of the needle around the outside face of this meter is equal to 10 gallons, so to be more precise, one could say the reading was actually 0015416 gallons. However, this degree of precision is not necessary and can be confusing. The District only needs the numbers read directly off of the totalizer, not the individual gallons obtained from the needle. It is important include all of the digits, including the zeros before the 15420 and the last stationary zero. 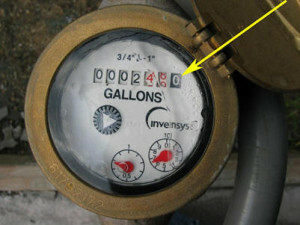 In the second example to the right, the water meter below also has one stationary zero. The reading should be as follows – 0002480 – which includes both the stationary zero at the end and the three zeros before the 2. The actual amount is 2,480 gallons. The District is not concerned with the numbers on the small dials; those are used to check how many gallons per minute are being produced or to check for leaks in your system. In this last example to the right, there are two stationary zeros. The precision of the totalizer in this case is 100 gallons. The reading should be reported as 23606500 gallons. District staff is available if you need any assistance interpreting your particular water meter. Feel free to call (831) 658-5642 to schedule an appointment if necessary. Water Distribution Systems – All water producing facilities within the District are defined in Rule 11 as Water Distribution Systems (WDS). Before starting the MPWMD WDS Permit process, a Water Well Construction Permit must be obtained from the Monterey County Environmental Health Bureau. The well must be drilled and a State Well Completion Report must be provided. All owners of new wells located in the District are also required to obtain a Water Distribution System Permit or a written Confirmation of Exemption from the District. The determination of whether a well is Exempt or subject to a Level 1, Level 2 or Level 3 WDS Permit is based on the well location, number of parcels served, production and potential impact to the Monterey Peninsula Water Resource System (MPWRS). Please carefully review the 2014 Implementation Guidelines for a detailed explanation of the permit process and for guidance on how to apply. The Exemption Request Form and WDS Permit Application Form are also included in the Implementation Guidelines. WDS Permits processed by staff administratively are currently $1,200 for Level 1 and Level 2, and $3,000 for Level 3. A Confirmation of Exemption is $600. Please refer to the WDS Permit Fee Schedule for additional information. For all Permits and Exemptions, MPWMD staff must prepare Findings and Conditions of Approval based on written documentation and consistent with existing MPWMD Rules and Regulations. 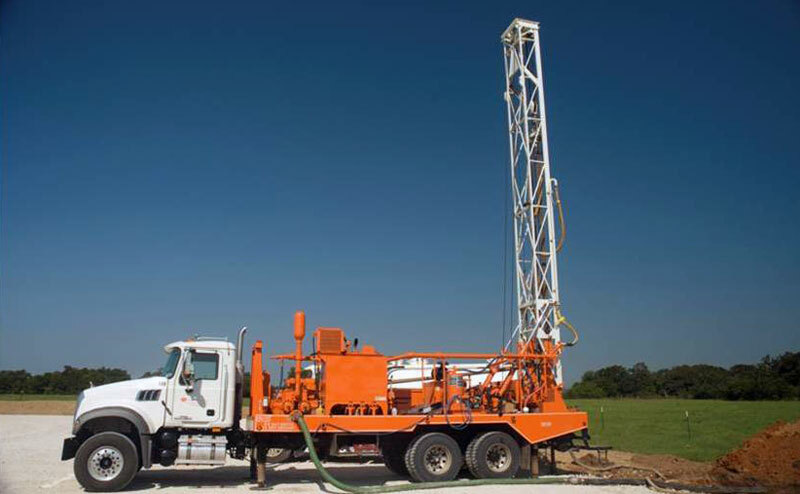 Depending on the situation, the WDS Permit process may involve well capacity testing to ensure the reliability of the well and to assess its potential impact on other wells and sensitive environmental receptors. For most Fractured Rock Wells outside of the MPWRS, hydrologic testing above and beyond the standard testing required by the Monterey County Health Department is not required and production limits are not set. An exception is if there is the potential for a well to have an adverse effect on the MPWRS. For all other situations (i.e., wells with the Monterey Peninsula Water Resource System), the Procedures for Preparing Well Source and Pumping Impact Assessments must be followed and a report prepared by a Qualified Groundwater Consultant. MPWMD Rules 20, 21 and 22 primarily guide the WDS Permit process. They can be viewed at: https://www.mpwmd.net, click on “Rules and Regulations”. For more information regarding Water Distribution System permits, contact Gabriela Ayala or Stephanie Kister at (831) 658-5601 or Gabby@mpwmd.net or skister@mpwmd.net. For more information on well registration and metering, contact Tom Lindberg at (831) 658-5642 or tom@mpwmd.net.